Kit and Caboodle Timaru: Another update...! Hi de hi ladies, Beck here. How are we? Good? Great! Those of us in South Canterbury are very much looking forward to a long weekend this weekend for Anniversary Day. Woop woop! Love me a three day weekend, ha ha!!! 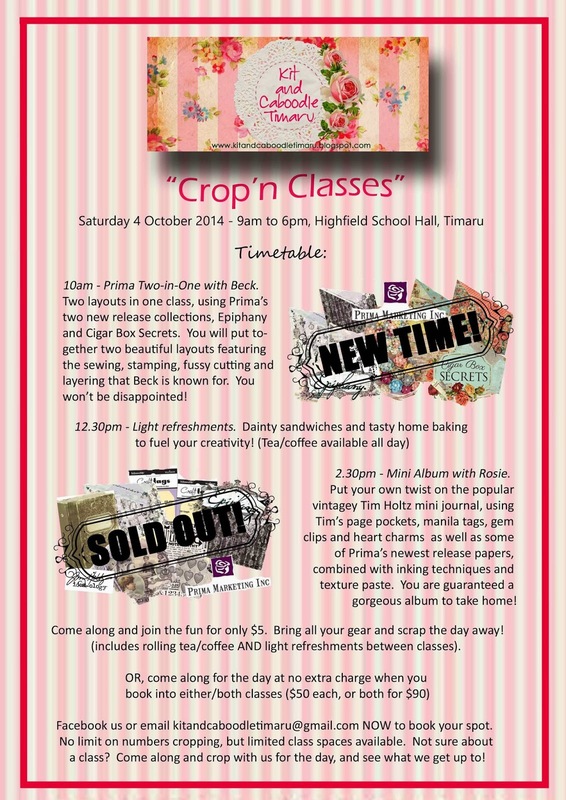 Now, I have an update for y'all from Rosie and I... As mentioned last time, we had to delay our Crop'n Classes event. However, I am pleased to announce that it is ALL GO for October 4th! If you're not sure about a class, come along and scrap for the day. See what we do, and how it all works. Only $5 to come along, and you get fed and watered too. The other good news (or bad news, depending on how you look at it) is that Rosie's Mini Album Kit is SOLD OUT! Wahoo! Thanks for your support gals. There are only 4 Layout Kits left, so if you're sitting on the fence, don't wait much longer... Or, if you are after an absolute bargain, we've decided to sell the last of our July kits off at a discounted price - only $40 each for either Rosie's Layout Kit or Beck's Card Kit. There's not many of them left either, so if you're keen, let us know asap via Facebook or email Rosie and I at kitandcaboodletimaru@gmail.com. She who hesitates MISSES OUT! Righto, Rosie and I will have sneak peeks of the finished products ready for you early next week, as well as a list of what you will need to do the kits at home. Until then, we have work to do!